A didactic route in the green. Near to Havana, in the island of Cuba, there is a 600 hectare botanic garden with 35 km of paths. A vast collection of palms. 600 hectares, 35 Km of paths, 3 small lakes, 4.100 square metres of greenhouses, a staff of 350 persons, more than 4.000 botanical species, 180.000 woody plants, 1.600 mm of rainfall per year, and an enviable average temperature of 25 °C; these are self explanatory data, for the last born among the great tropical botanical gardens: the Jardin Botanico Nacional de Cuba. Its construction, started from zero, in 1968, on a degraded vegetable ground, used as pasture-land, 25 Km south of Havana, is not yet completed, but, opened to the public from 1984, now guests more than 200.000 visitors per year. We move around on foot, or on small wagons, pulled by funny red tractors, and perplexed, more than Alice in the Wonderland, between the pages of an immense green atlas. 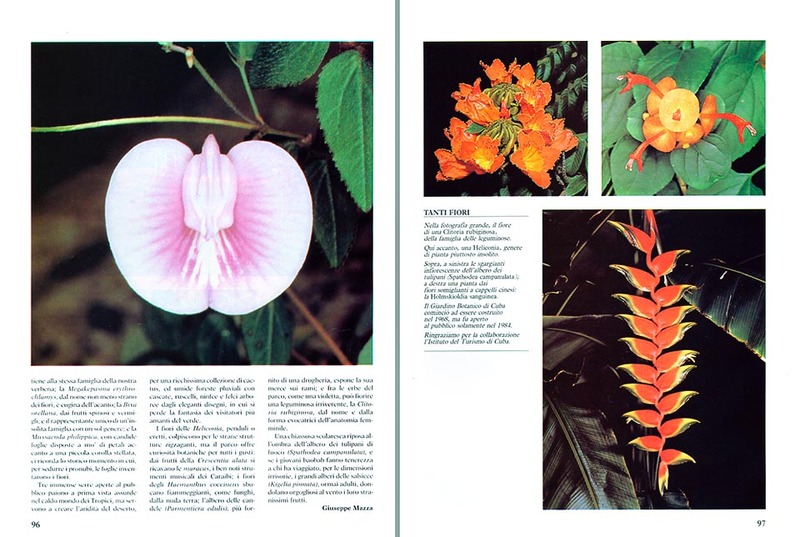 “The modern botanical gardens”, the director, Mrs. Angela Leiva, comments, “join the indispensable scientific rigour to recreational and teaching exigencies. So, we have consecrated about half of the garden to the world phyto-geography, with areas dedicated to Australia, Oceania, South-eastern Asia, India, Africa, South America, Central America, Antilles, and Mexico, and 120 hectares to the phyto-geography of Cuba. Here, with a rapid zooming, the scale of the atlas becomes really small, to show, in details, the various botanical habitats of the island. The reconstruction of the Maringuas Costeras, associations of xerophyte and succulent plants, comparable to our Mediterranean bush, has needed ten years of works, 40.000 cubic metres of calcareous stones, heaped for 50-100 cm, on a surface of 4 hectares, and the taking, in the wild, of more than 200 species, of which 87 endemic; the Montes secos, brushwoods of the arid areas, exhibit about one hundred species, between which 24 endemic, often useful for the human activities; the Sabanas de Jucaro y Palma recreates a herbal and flat landscape, with small palms, typical of the badly drained coastal hinterlands; in the Montes, semicaducifolias wave their tops the great native trees, rich of bromeliaceae and epiphyte orchids; the Vegetacion de Mogotes, curious Cuban calcareous monoliths, tall even various hundreds of metres, offer a rich collection of endemic species; and the Pinares, typical pine-forests of acid habitats, have been perfectly recreated, on the basic soil of the park, with the recourse of a special ecological form of Pinus cubensis, discovered and gathered on a calcareous ground, and wide use of the Pinus caribaea, more tolerant under cultivation. “But the major work,” explains to me Mrs. Angela Leiva, “is by sure the Vegetacion sobre Serpentinas, an ecological habitat absolutely particular, which guests about the 14% of the Cuban endemic plants. For realizing it, on the surface of one hectare, they had to take off 80-100 cm of soil, and replace it with 12.000 cubic metres of serpentinite, an ultra-basic rock, which has come from far away, by hundreds of lorries. Enormous costs, not to talk of the transplantations of more than 200 species, with the taking, in the serpentine area of Canasi, of about one thousand of palms and shrubs. We discover in this way, in this area, really unique species, such as the Guao (Comocladia dentata), an Anacardiaceae with such a caustic juice, due to which, for some persons, particularly sensible, it is sufficient to sit down in its shade, without touching it, to get serious cutaneous inflammations. Plant, by sure, not attractive and not to be frequented, but which is proving to be precious in the treatment of herpes. This might push also the “non botanists” to ponder about the importance to preserve, in all the world, even for personal selfish therapeutic advantage, also plants apparently useless or negligible. With each species which dies out, we lose for ever, in fact, an immense heritage: the result of millennia of evolution, perhaps the remedy for diseases until now incurable or unforeseeable. She shows to me, proudly, a huge nursery, and the laboratory, where they reproduce, successfully, in vitro, the very rare Microcycas calocoma of Pinar del Rio. Similar, at sight, to a small palm, is, as a matter of fact, an authentic “living fossil”, which does not reproduce by seeds, but by eggs. It belongs to the Cycadaceae, a group of very old gymnosperms, nowadays almost extinct, which were looking during the Mesozoic, the dinosaurs into their eyes. 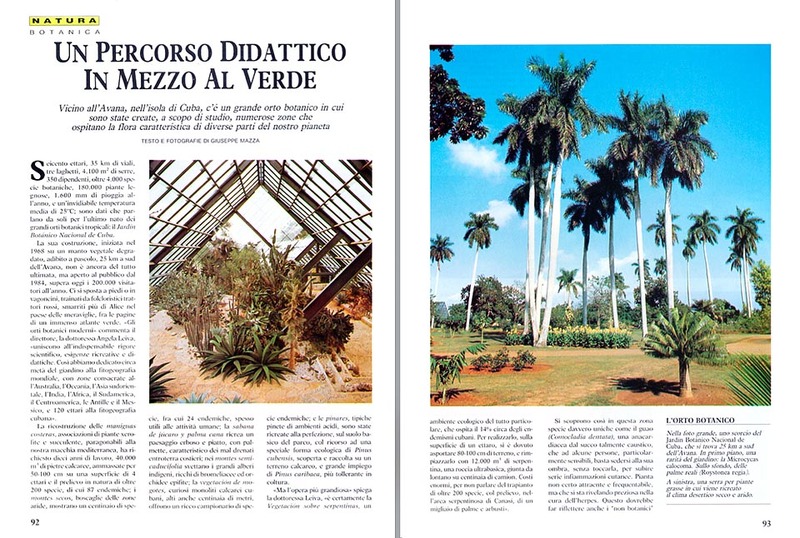 Two vast zones of the garden are dedicated to the plants useful for the man and to the prehistoric ones, but the attention of the visitor goes mainly to the huge Palmetum, on of the richest in the world. With more than 150 species of palms, 40 of which Cuban it makes a garden into the garden, and by itself is worthy of a travel to Havana. Even if some specimen are young, and at least twenty years will be needed till when they can reach the typical adult appearance, we are stuck by the elegance and the enormous variability of these one-head plants, not much known in our climates. Halfway between the grasses and the trees, the palms present in fact only one frail gemma on top, and they cannot afford to risk any frost, as, losing the head, they would lose, as for us, the life. We discover, then, the Bottle Palm (Mascarena lagenicaulis = Hyophorbe lagenicaulis), with the unusual trunk swollen like a leather bag; the very rare Cuban Underskirt Palm (Copernicia macroglossa), which covers, shameful, the trunk, almost up to the feet, of dead leaves; the Gastrococos crispa = Acrocomia crispa and the Bactris edulis, both bristling with thorns, like cacti; the Solitary Fishtail Palm (Caryota urens), with urticating fruits and leaves of a beauty beyond description; the majestic Cuban Royal Palm (Roystonea regia), and the elegant Manila Palm (Veitchia merrillii = Adonidia merrillii), with scarlet fruits between which ogle, in a funny contrast, small green iguanas (Anolis sp.). 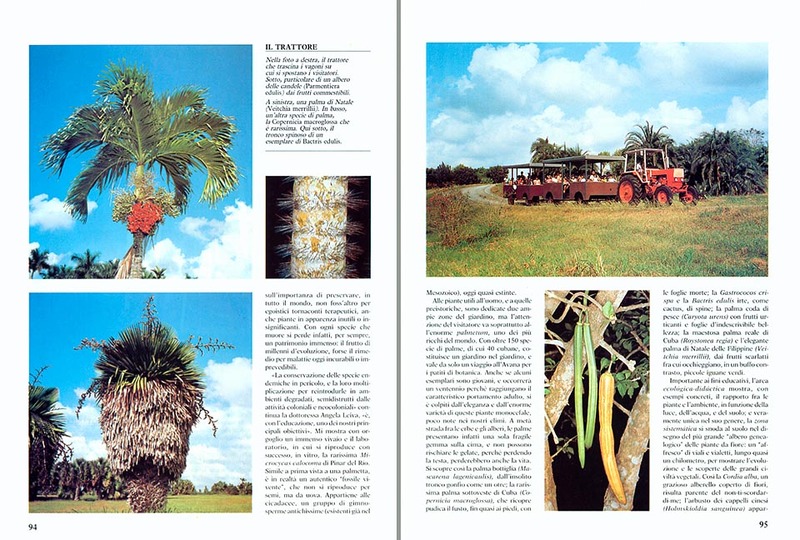 Important for educational purposes, the area Ecologica-didactica shows, with concrete examples, the relationship between plants and habitat, depending on the light, the water, and on the soil; and really unique in its kind, the Zona Sistematica winds on the ground in the drawing of the biggest “family tree”, of the flower plants. A “fresco” of paths and small passages, almost 1 Km long, to show the evolution and the discoveries of the great vegetable civilizations. The Cordia alba, a charming sapling covered by flowers, thus, turns out to be a relative of the Forget me not; the shrub of the Chinese Hate Plant (Holmskioldia sanguinea), belongs to the same family as the vervain; the Megaskepasma erythrochlamys, with the name as strange as its flowers, is a cousin of the acanthus; the Bixa orellana, with vermilion and thorny fruits, the only representative of an unusual family with only one genus; and the Mussaenda philippica, with candid leaves, placed like petals close to a small stellated corolla, recalls to us the historical moment when, in order to seduce the pollinators, the leaves invented the flowers. Three huge greenhouses open to the public, seem, at first sight, absurd in the warm world of the Tropics, but are used to create the dryness of the desert, for a very rich collection of cacti, and humid rainy forests with waterfalls, streams, water-lilies, and arboreal ferns with elegant drawings, where gets lost the fantasy of the most attentive visitors. The flowers of the Heliconia, pendulous, or upright, strike for the odd zigzagging structures, but the park offers botanical curiosities for all the tastes: from the fruits of the Crescentia alata they get the maracas, the well known musical instruments of the Caribbean; the flowers of the Haemanthus coccineus come out, blazing, like mushrooms, from the bare land; the Candle Tree (Parmentiera edulis = Parmentiera aculeata), richer than a grocery, shows its goods on the branches; and, between the grasses of the park, like a violet, can blossom a disrespectful leguminosae, the Clitoria rubiginosa, with name and shape recalling the feminine anatomy. A rowdy body of students rests in the shade of the African Tulip Tree (Spathodea campanulata), and if the young Monkeybreads cause some tenderness to those who have been travelling, due to their reduced dimensions, the great Sausage Trees (Kigelia pinnata = Kigelia africana), by now adult, swinging proudly at the wind their very unusual fruits.